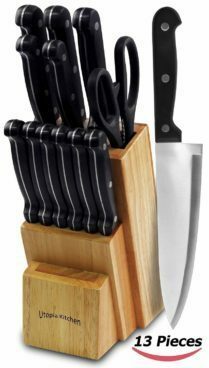 13-Piece set includes multiple models of the items: 8″ chef knife, 8″ bread knife, 8″ carving knife, 5″ utility knife, 3.5″ paring knife, 5″ steak knife (6 pieces each having 1.5 mm thickness). Also includes Pair of Kitchen Scissors and Butcher Block for convenient storing of the knives. Conservative blade thickness and elite design allow for easy handheld use. Knife Blades are made from 420 grade 3Cr14 Stainless steel. The following formula is a break down in the steel: Around 13% chromium and 3% carbon. It has a HRC of 52-55 making blades relatively soft. Tarnish-resistant, rust-resistant, and easy to clean Stainless steel blades. Scissors blade are made from 420 grade Stainless steel. Polypropylene plastic is used on handles which possesses high flexural strength because of its semi-crystalline nature. It is very resistant to moisture. It has good chemical resistance over a wide range of bases and acids. It possesses good fatigue resistance. It has good impact strength. It has a good resistance to electricity and is thus a good electrical insulator. We think you’re going to love this Knife Set as much as we do! But in case you don’t, you are covered by our 30 day, no questions asked, money back guarantee. We want our customers to be 100% happy.